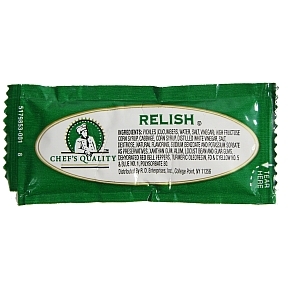 9 gram sweet relish packet, individual size. Ingredients: Pickles (cucumbers, water, salt, vinegar), high fructose corn syrup, cabbage, corn syrup, distilled white vinegar, salt, dextrose, natural flavoring, sodium benzoate and potassium sorbate as preservatives, xanthan gum, alum, locust bean and guar gums, dehydrated red bell peppers, turmeric oleoresin, FD & C Yellow No. 5 & Blue No. 1, polysorbate 80.